We are preparing for spring on the farm and it is a crazy, busy time! It was an unusual winter here……..warm and dry, with only a couple of inches of snow all winter. We finally got some rain this past week and are anticipating more this week. Hopefully we are coming out of this dry spell. With so much going on around here, I will try my best to keep you updated. I got my spring garden planted last week. Jeff had the garden all tilled and generously spread with alpaca poop. I planted turnips, beets, spinach, lettuce, onions, carrots and tons of radishes. There is nothing better than fresh radishes, right out of the garden! As I was planting, I kept my eye on a slow-moving rain storm coming from the southwest. Usually my timing isn’t that great, but this year I was able to get that garden in right before the rain kicked in. We received some badly needed moisture. My garden and I were thankful! We have had Strawberry Patch issues over the last few years. We have tried several different ways to grow strawberries and it seems like we just end up with a big, unruly, out of control weed patch (and, if we were lucky, maybe a couple of ripe strawberries that weren’t rotten, mashed or had been stepped on). I had strawberries at our first house and it didn’t seem that hard, but here, I don’t know, it has just been a mess. True, we have had a couple of bad years, no rain at all one spring, then the next, so much rain that what berries we had rotted before we could get to them. I have had a plan to build a “better” strawberry patch so we are going to give it a try this year. Last week, Jeff tilled up an area for my patch and placed concrete blocks around for edging. We ended up with an area of about 2 feet by 20 feet. It’s not the prettiest thing, but I’m hoping it will be functional. It is a little early here to purchase strawberries so I am watching for sales and will hopefully have them planted in a few weeks. My hope is that with my new patch, 1) the strawberries will be controlled and kept within the blocks and, 2) I will be able to weed and pick strawberries without having to walk through the patch itself. We will see how it works out. If I can finally get a successful, easy to maintain patch going, we will probably build another one and get it started next year. I will keep you posted! I am very excited to announce that we will be starting a small orchard on our property. We have purchased 10 fruit trees that are packaged so that they are good for our location and good for cross pollination. They should be delivered by the end of this week and we are expecting 3 apple trees, 2 peach trees, 2 pear trees, 2 plum trees and 1 cherry tree. Since we have a very busy weekend ahead of us, we decided to go ahead and start preparing the holes this past Sunday. It took a lot of time preparing 10 holes on Sunday afternoon so we were glad that part of the job is out of the way. We are expecting more rain this week, so also didn’t want to take the chance that it would be too wet to dig. We want to get the trees in the ground as quickly as possible once they arrive. 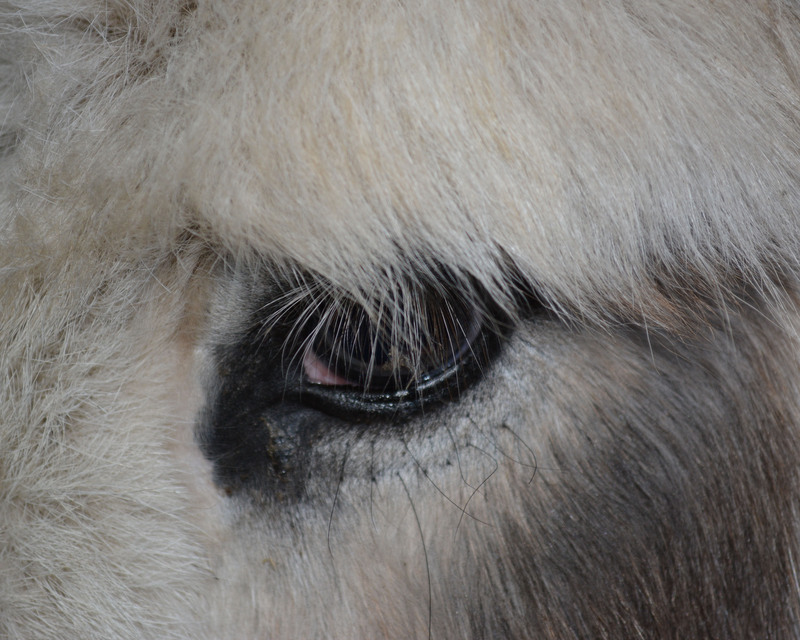 I am preparing for the MOPACA show this weekend. The show will be at Hale Arena in Kansas City this weekend and will have lots of alpacas, vendors, fiber and some great competition in the show ring. We will be one of the vendors and since this is one of the bigger shows we do and with it pretty much being our first show of the year, there is lots of prep work to be done. I will be setting up for the show on Friday and the show and vendor booths will be open both Saturday and Sunday. This is just a bit of what we have accomplished the past week and what we have in the works for the farm this year. Next week, I will update you on how the spring garden is doing, if I’ve found any strawberry plants, the progress of our little Orchard and the MOPACA Show in Kansas City. Until then, enjoy some other pictures of Early Spring on the Farm! 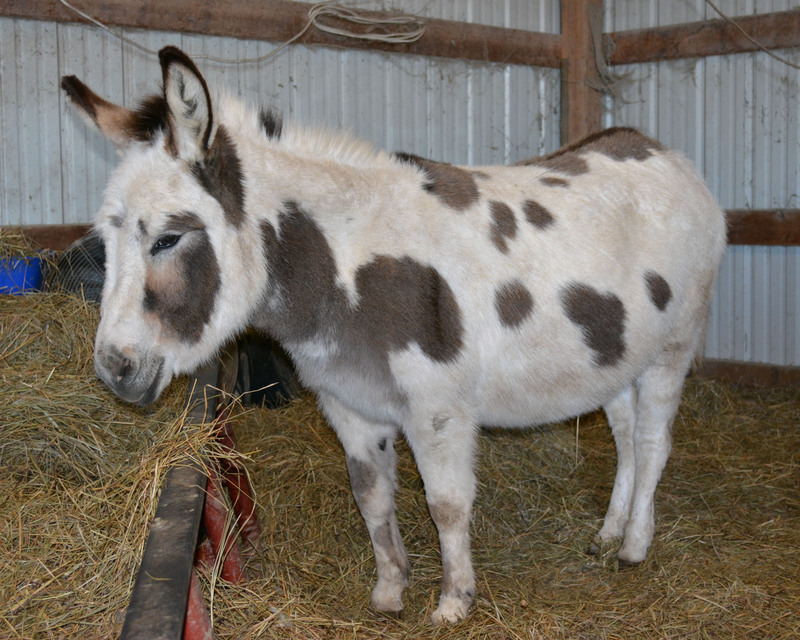 We introduced two very special additions to our farm family in November…..miniature donkeys Jelly & Jalapeno. 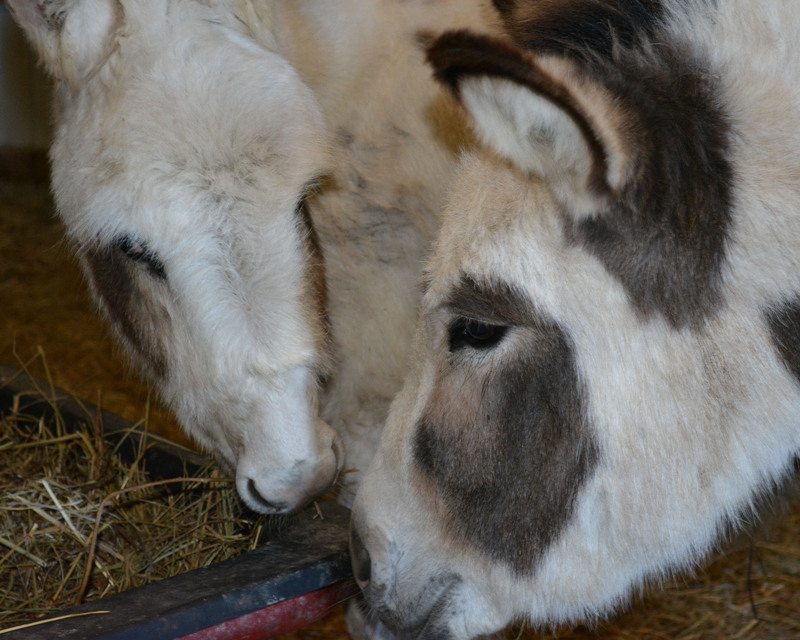 It took us no longer than a minute to fall in love with these two adorable, sweet donkeys. Their personalities, curious minds, loud braying and a bit of orneriness here and there never fail to make us laugh! 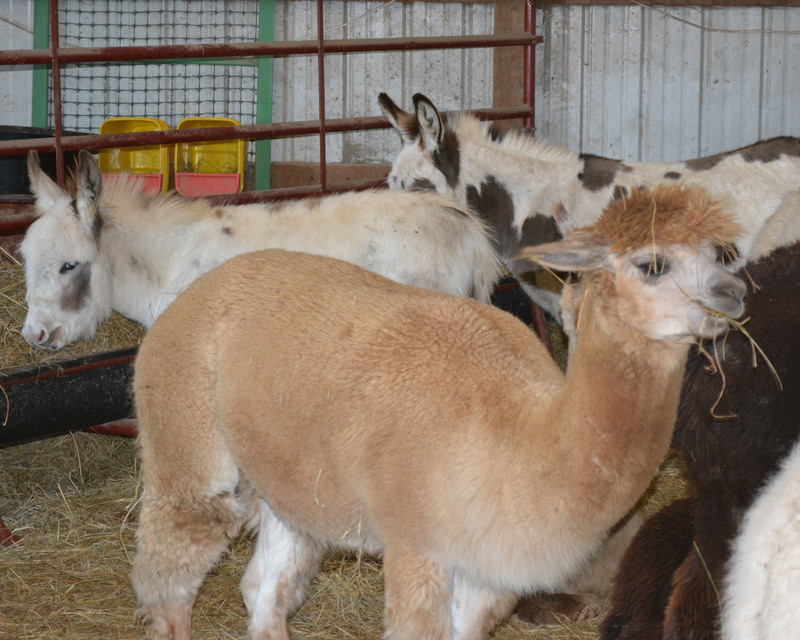 We did wonder how Jelly & Jalapeno would react to the alpacas and the alpacas to them, so when the donks first arrived they had their own space in the barn with the female alpacas. The donks were able to meet the alpacas through the cattle panels, but each still had space to slowly get to know each other. The first few days were interesting as they got used to each other. But soon everyone settled into a routine. We intended to mix them together within a few weeks but due to some bitterly cold weather and way too much going on during the holidays we just didn’t get it done. But one day, it all happened anyway. I don’t know if we left the gate between the two open, or if the donks opened it themselves (would not have surprised me), but we got home from work one day and everyone was peacefully grazing together. 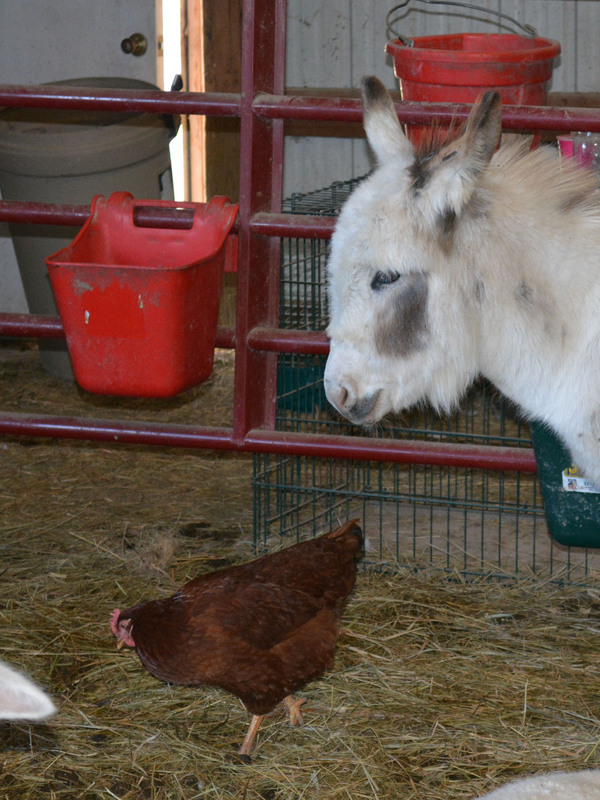 The chickens and Aflac the duck are quite comfortable around the donkeys too. The day that I was out taking pictures, Jelly seemed unconcerned and just wanted to eat. 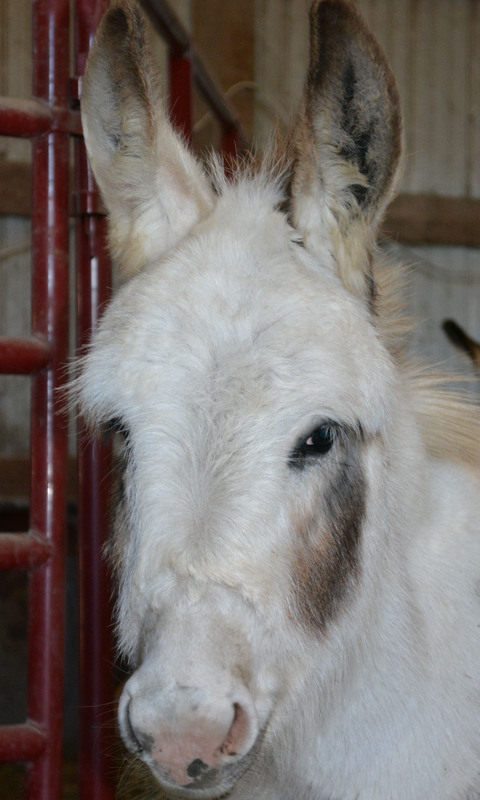 But Jalapeno definitely wanted his picture taken….was a real photo hog. In fact, I really didn’t get a full body shot of him because he so enjoyed the closeup! 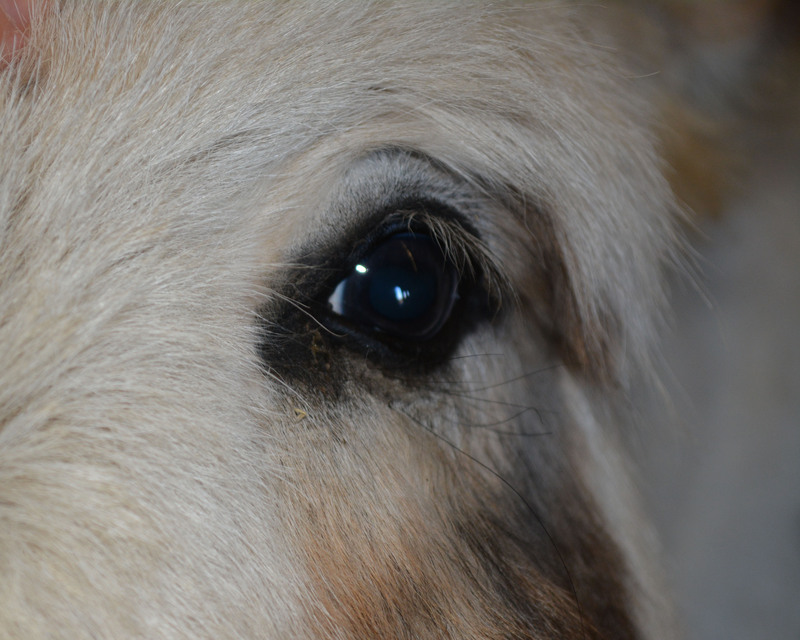 Here’s is one of his closeup shots…..
And a couple more of Jalapeno posing. He just couldn’t seem to stay away from the camera! I can’t tell you how much we have enjoyed having these two around the farm. Our alpacas are all a little shy and rarely come up just to visit. 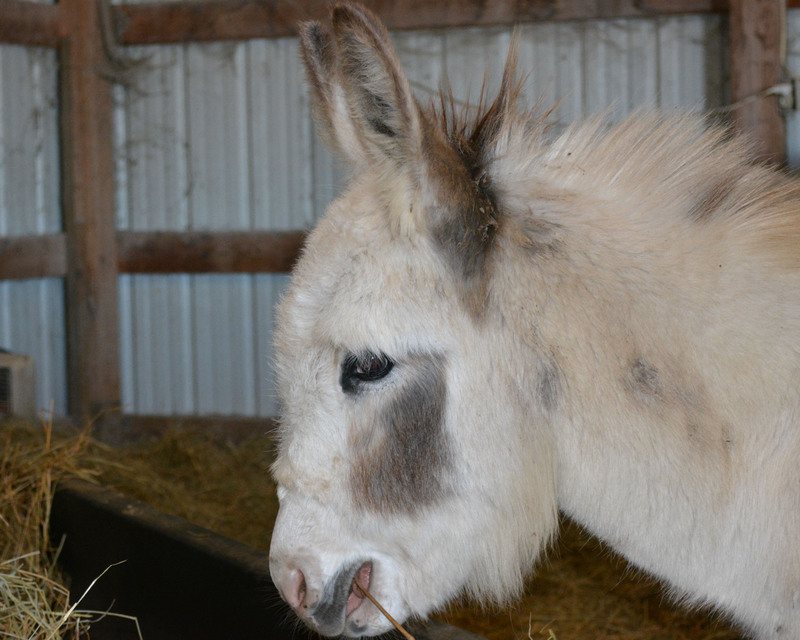 But Jelly & Jalapeno love to interact and it is so nice to be greeted by those sweet donkeys when we go out to the barn. It also amazes me how quickly and easily different animals learn to live together. The chickens and Aflac have learned to watch out for those big animal legs and feet, yet can be found right next to them on a cold night. The alpacas are maybe a bit annoyed by the loud braying of the donkeys and the donks are forever putting their noses down into the fiber of the alpacas, I’m sure curious as to what in the world that is all over those alpacas. But even though they are all very different in size, shape, color and voice, they have all learned to share the barn, hay, pasture and to become friends. It has been a stressful few days in and around the chicken coop! 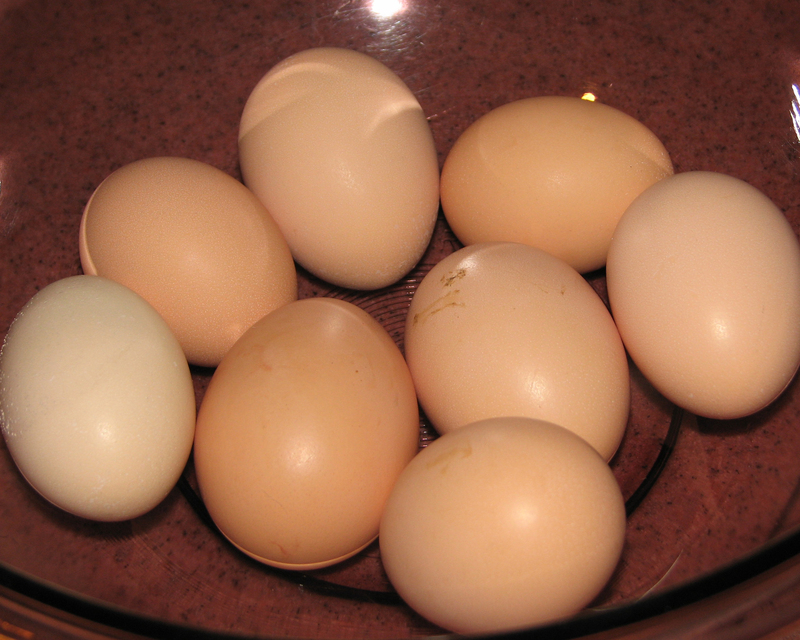 I have enjoyed having my hens (and all those fresh eggs) so much that I wanted more…….both chickens and eggs that is. 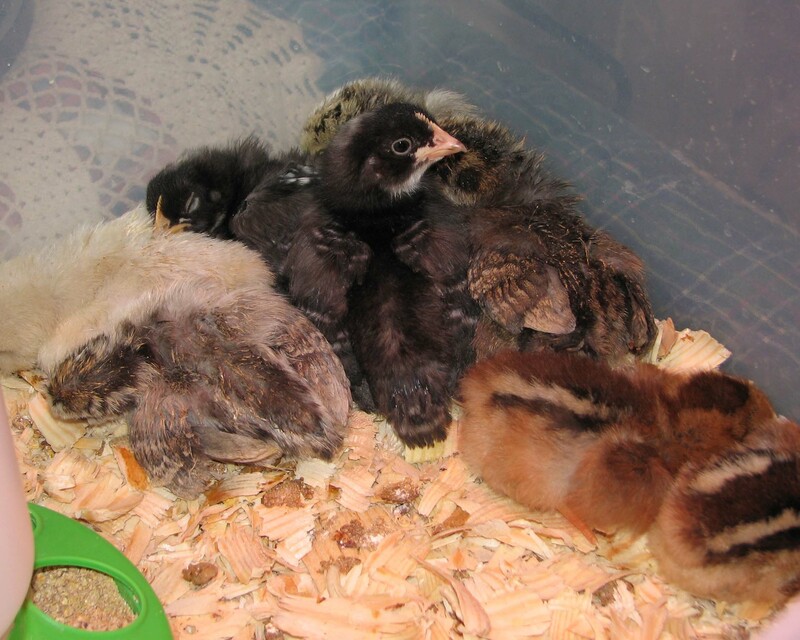 Right around the 1st of March, I purchased 8 new chicks (hopefully all hens) to bring home to the farm. I have been keeping them warm and safe in a big stock tank in the garage and they have grown like little weeds! It has been somewhat of a challenge this spring as our weather has been cold and wet. 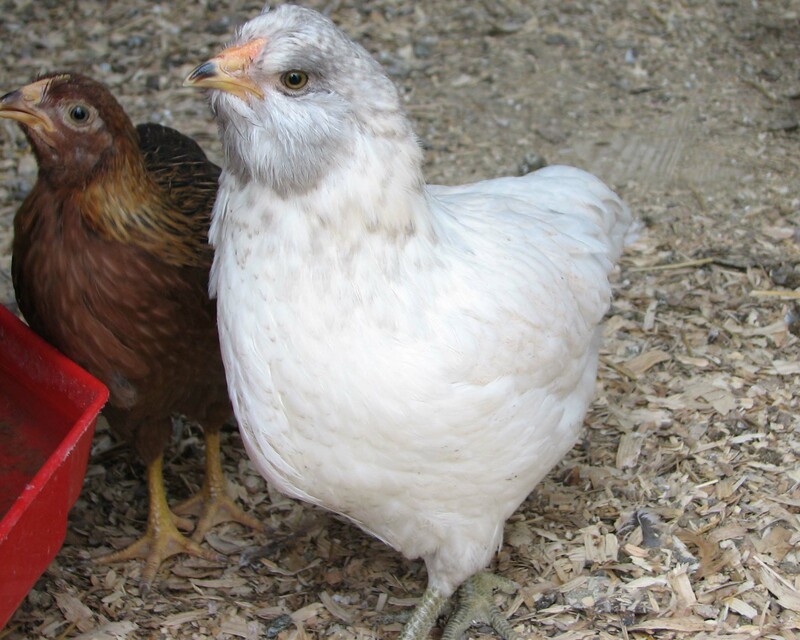 The chicks survived one big snow storm, a short power outage and many freezing nights but are doing well. So well, in fact, that I had to get them out of that stock tank! They were just getting too big. 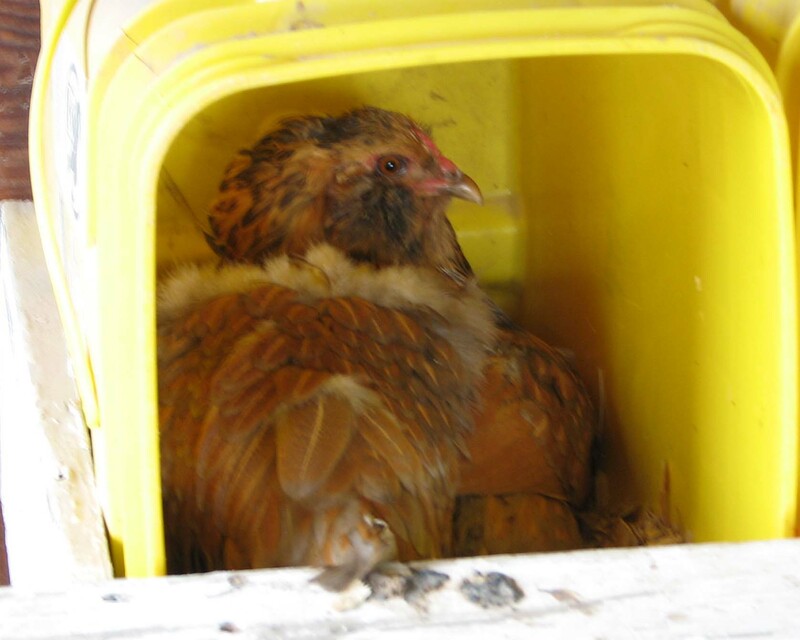 So last Saturday they were put in the coop with Mr. Puffycheeks and the hens. I’m not sure now that this was the best way to introduce them to each other, but at the time it seemed like the best option. We have been letting the hens and Mr. Puffycheeks, our rooster, forage around the yard all day for some time now. They all go back into the coop at night where they are content, sheltered and safe. 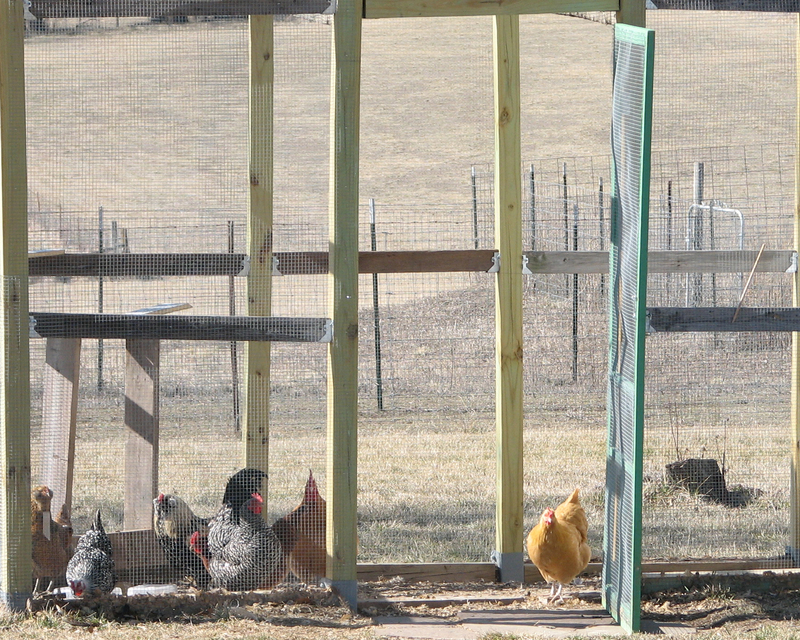 On Saturday, when we added the new chicks, we kept the coop enclosure shut. I didn’t want the new chicks running around too much until they knew where there home was. 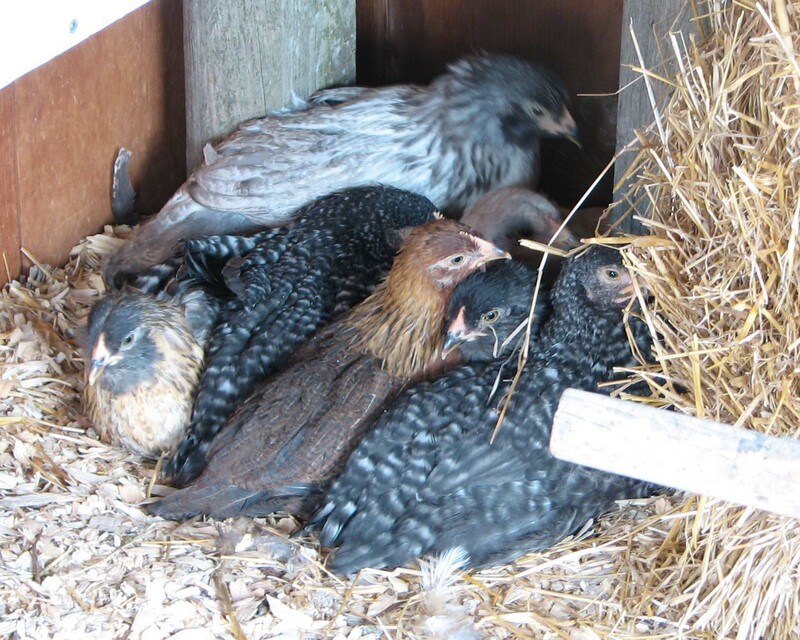 On Saturday, the chicks hid in a corner of the chicken coop and rarely if ever came out. The hens and Mr. Puffycheeks were a little mean to the new chicks, especially that first day. I can tell you, none of my feathered friends were happy on Saturday. 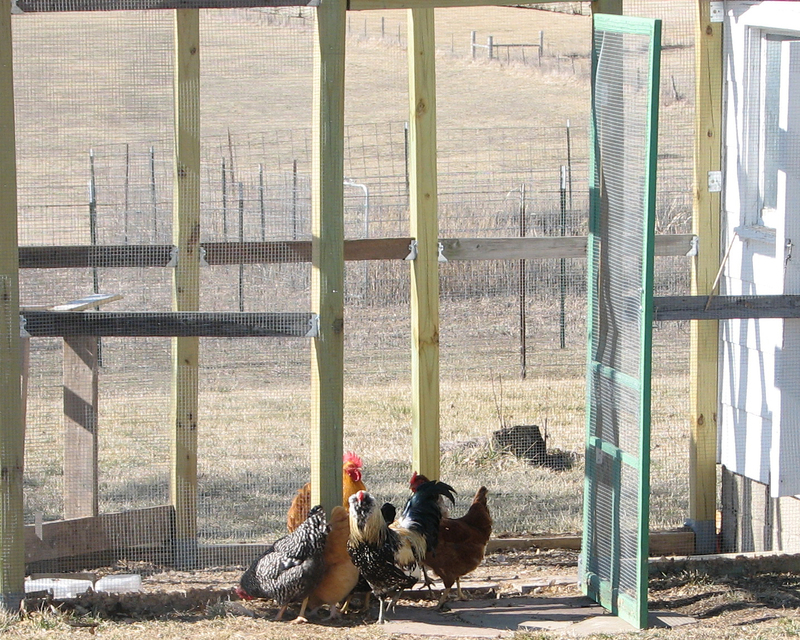 On Sunday, we opened the coop door. The hens and Mr. Puffycheeks came right out and enjoyed their day. Sunday morning the chicks were again hiding in the corner. 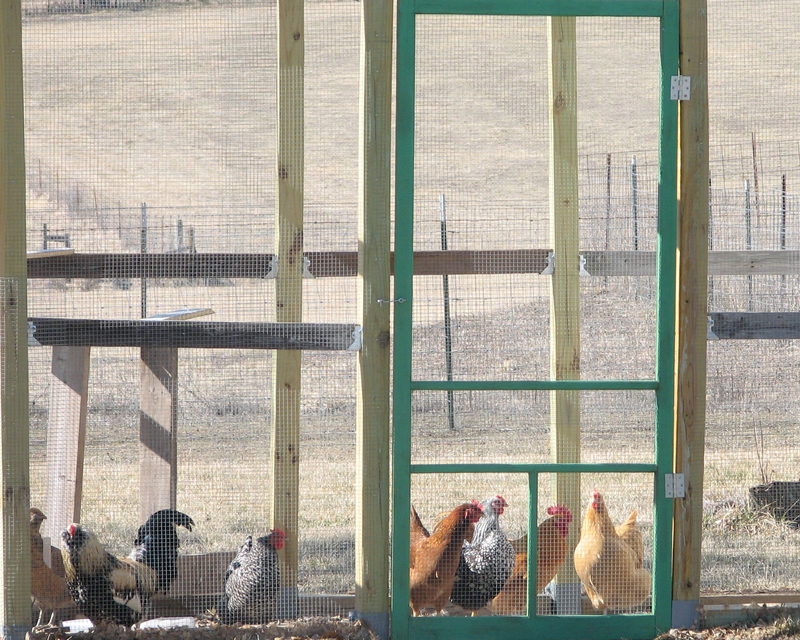 But by the afternoon they were out in the chicken coop, eating, drinking and trying out the roosting bars. 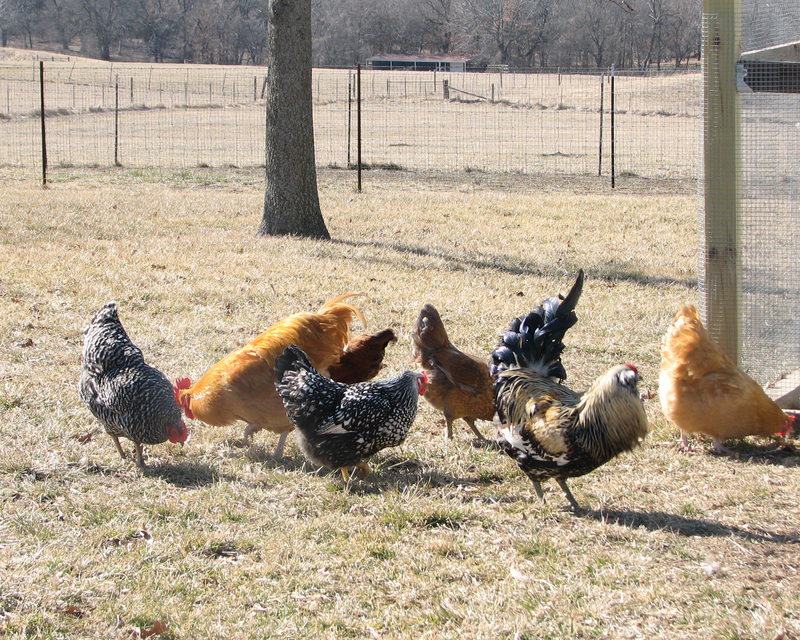 They seemed to be fine as long as the hens were out in the yard. I don’t believe that any of the chicks made their way out of the coop at all on Sunday. Things did seem a little less stressful once they were all in the coop and settled down for the night. Ethel was not very happy that I was invading her privacy during one of my visits to check on the new chicks! It wasn’t until Thursday that the new chicks began to venture out of the coop. They are still very careful around Mr. Puffy Cheeks and the hens but it is getting a little better every day. I can’t wait till they are all one happy family! Look what we got today!!! Our first colored egg! I had been waiting and waiting and had almost given up. What a nice surprise! 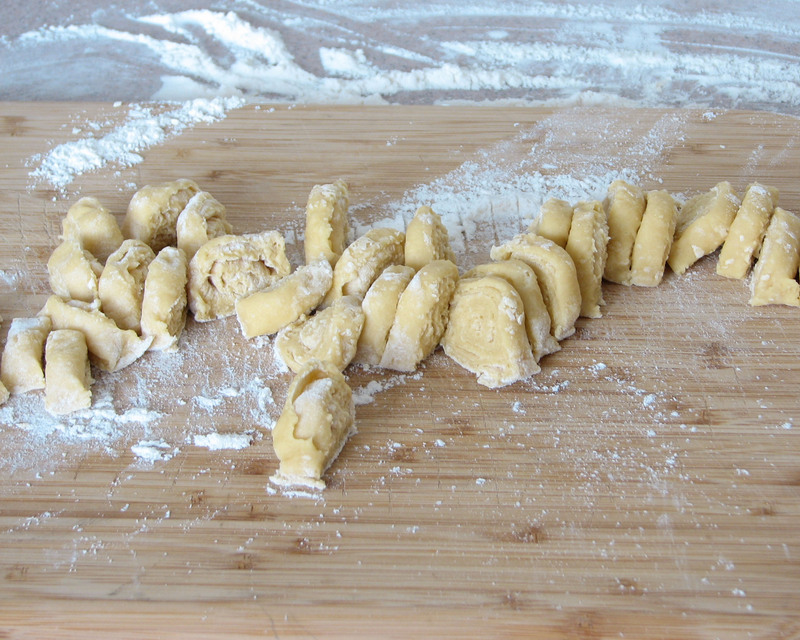 I have been thinking lately that I would like to make homemade noodles. My Grandma Anthony used to make these all the time. Jeff’s mom still makes them for Thanksgiving and Christmas. 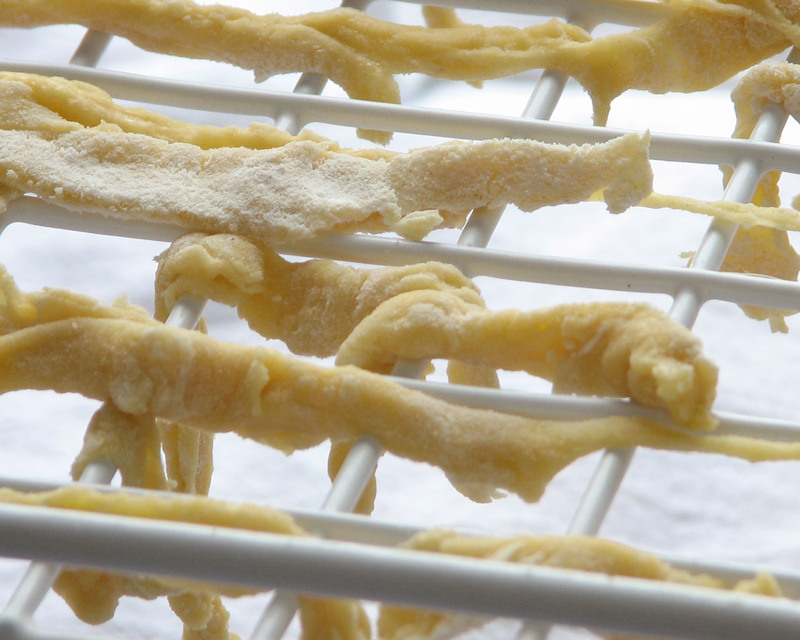 Making homemade noodles has been on my mind ever since my hens starting laying eggs. The only way, I think, you can make homemade noodles better, would be to use eggs that have been laid by your own spoiled hens! Now, I have never made homemade noodles in my life. I watched my grandmother do it many times and the recipe seemed easy enough…..there’s only a few ingredients for goodness sake. So I opened up my old Betty Crocker cookbook and went to work. 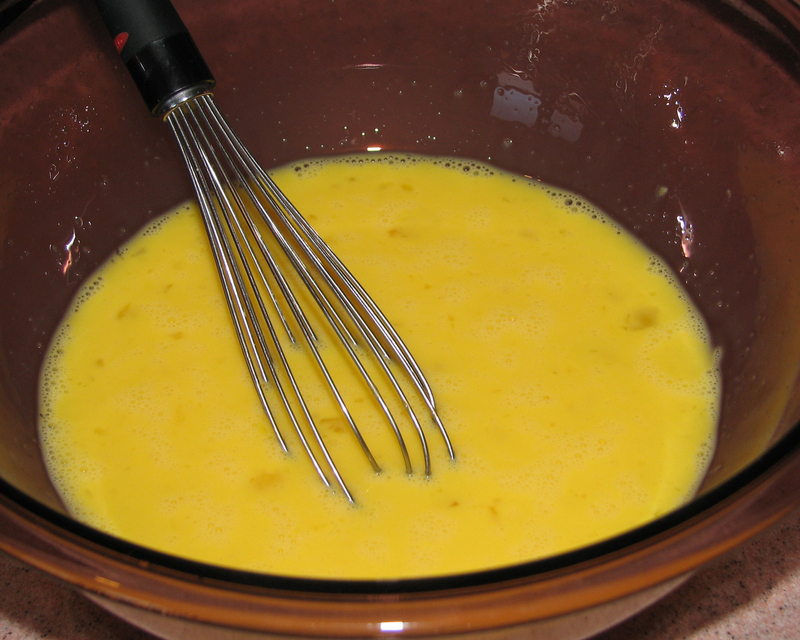 I combined the egg, milk, salt and flour and let it sit for 10 minutes. I put it out on a floured surface and rolled it into a very thin, 12 x 18 rectangle. You can see that my 12 x 18 rectangle isn’t really a rectangle at all, but that is how I managed to get it rolled out. 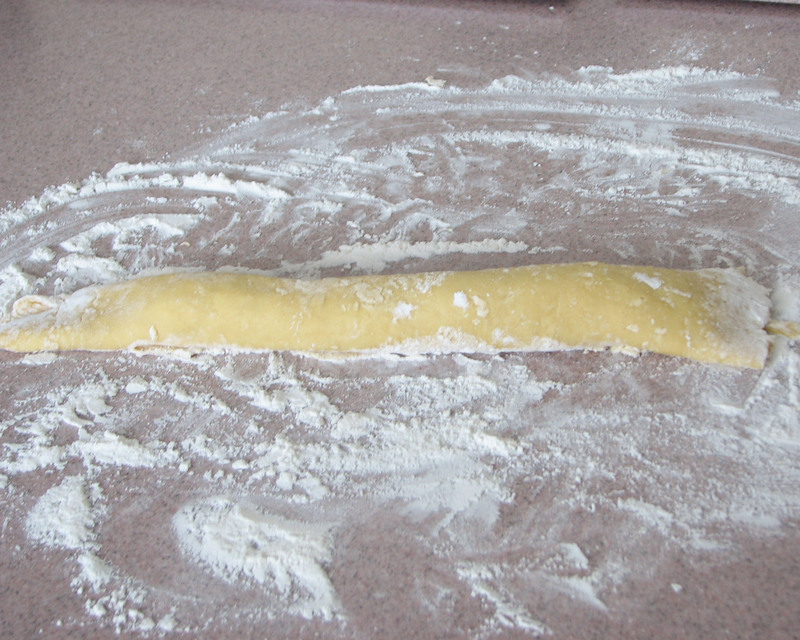 I loosely rolled up the dough and cut it into ¼ inch wide pieces. Now this is the point that I was starting to get worried. I could tell that the little rolls were going to be awfully difficult to unroll. And they were! 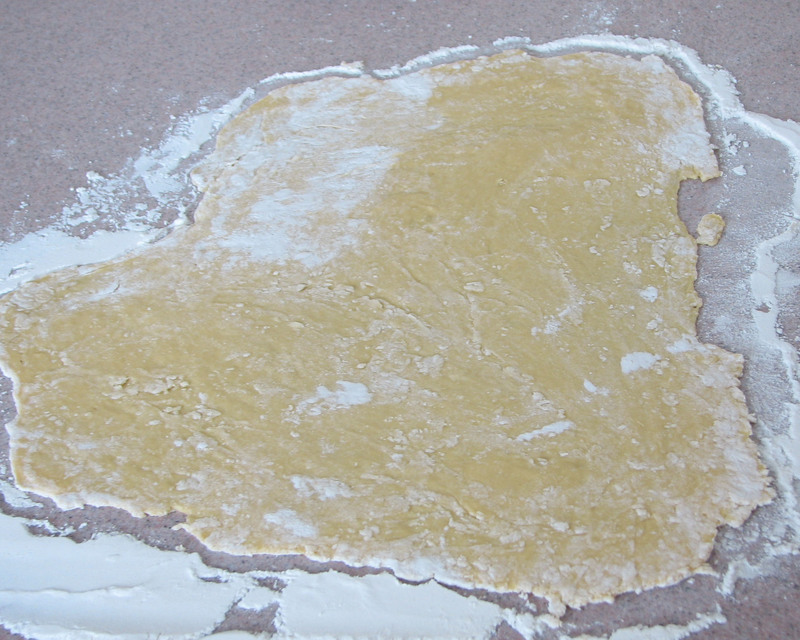 I don’t know if I didn’t use enough flour when I mixed them, when I rolled them out, or maybe it was the odd shape of my rectangle that did me in. But I couldn’t get those noodles unrolled nicely for the life of me. 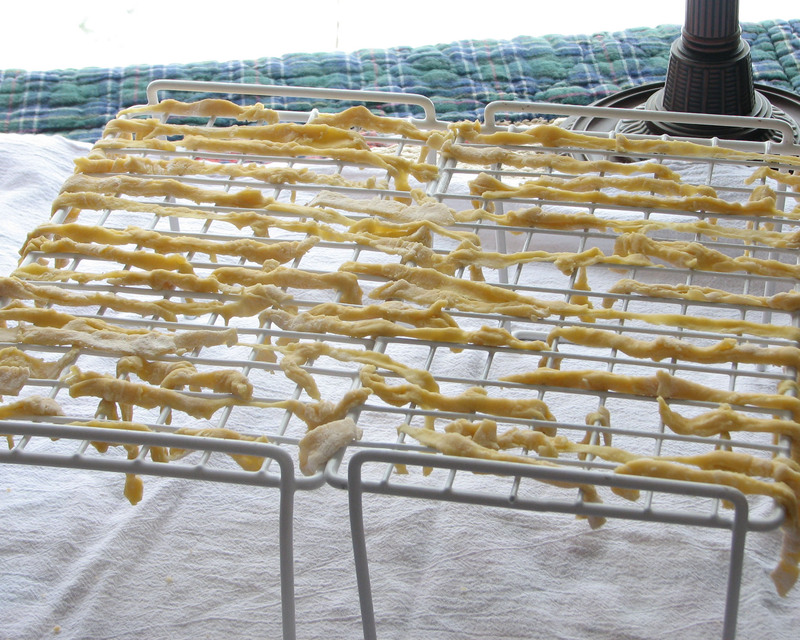 Here is what my noodles looked like when I finally set them out to dry. 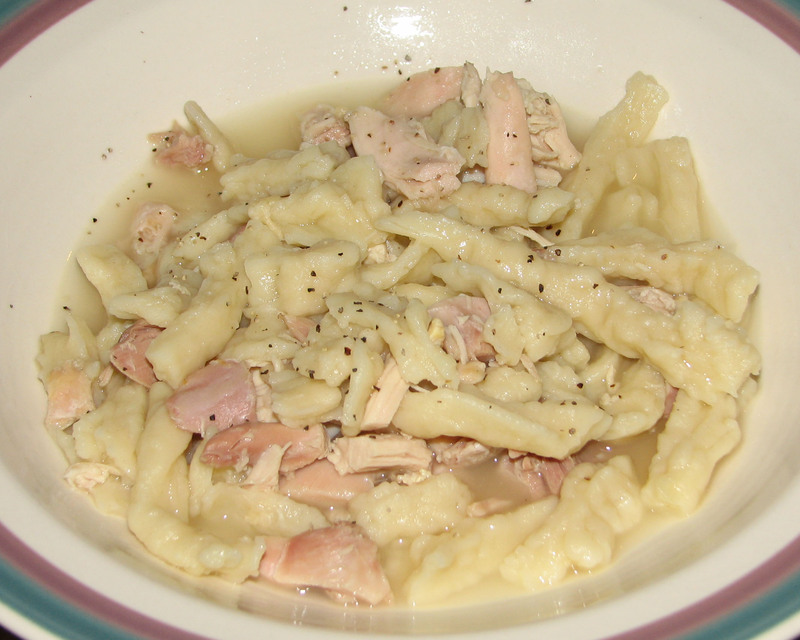 This is not how my grandma’s homemade noodles looked, I can tell you that. Now at this point, I should tell you that I almost didn’t post this. 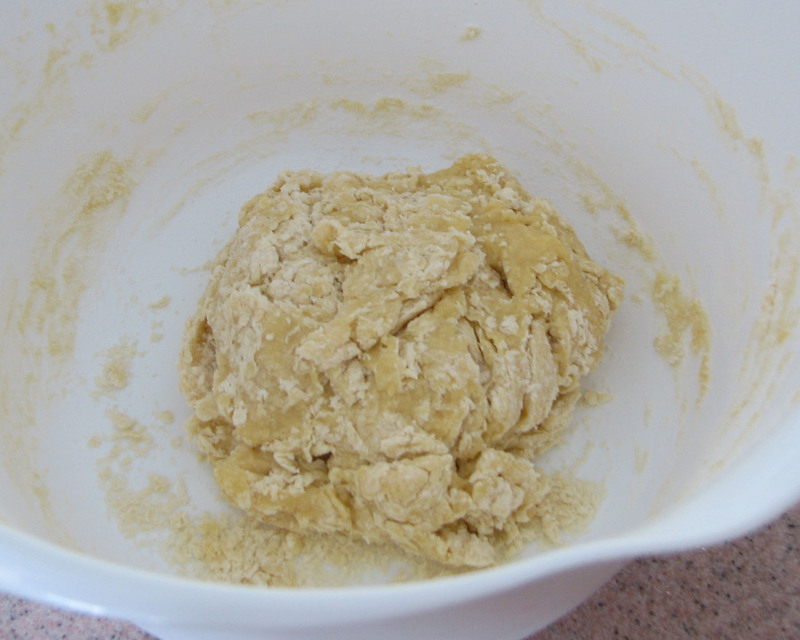 You see, my noodles did not turn out like I had planned, certainly not like my grandmothers or mother-in-laws do, in fact they looked quite awful! And since I am a perfectionist in many things I do (I really should get help for this) I didn’t want to post anything that wasn’t perfect. But then I realized, this isn’t how I want my blog to be. I want my blog to be about trying new things, learning from our mistakes and realizing that sometimes we have no idea what “perfect” really even is. When all was said and done, even though my noodles looked, well a little odd, my Chicken with Homemade Noodles tasted amazing! Perfection! Sunday was a beautiful day here in Missouri, especially for February. It was unusually mild, mid-50s and just a nice day to be outside. So it was the day I decided to let the chickens out of their coop. 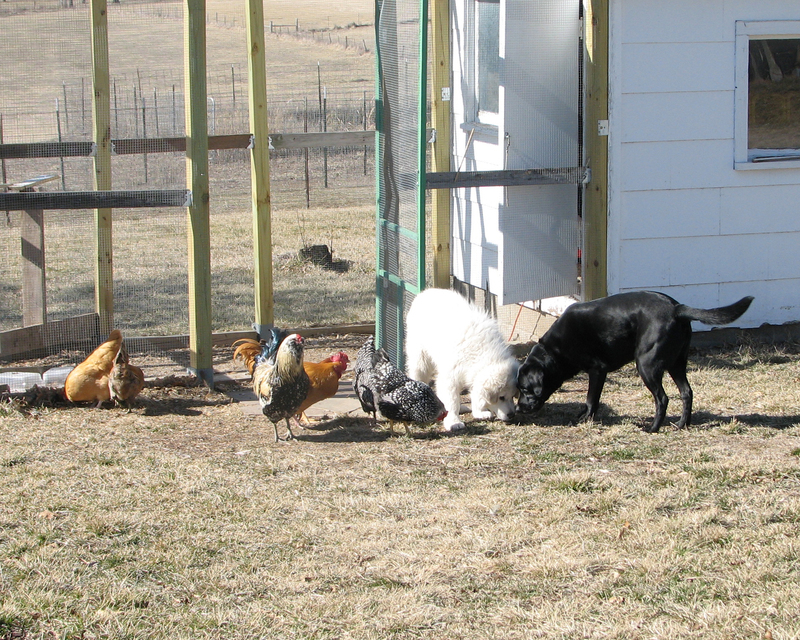 As the weather gets nicer I plan to let them out most of the day so that they can forage around and enjoy more space. It was a little nerve wracking, letting them out of their safe space. 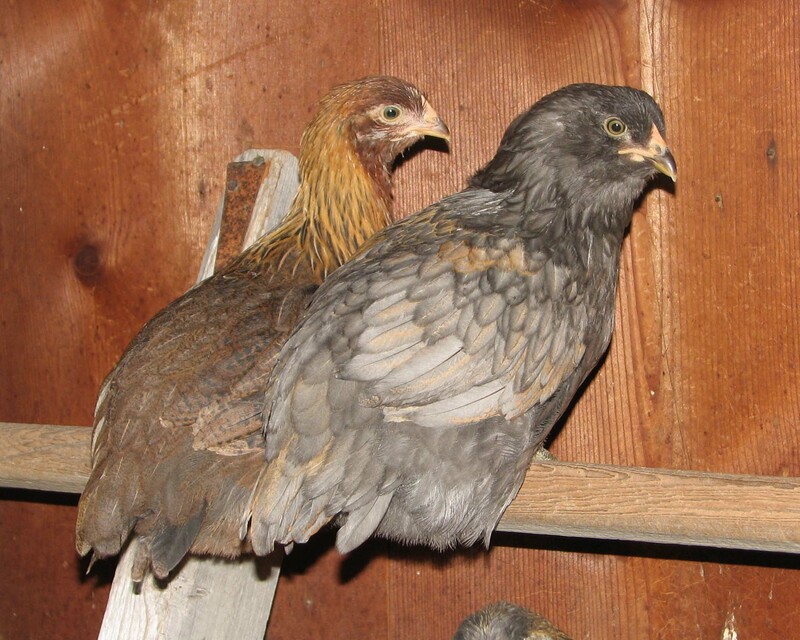 I wondered if I would be able to get them back in the coop. I was also worried about how our dogs Balto and Shadow would do and if they would bother them. Balto is our new LGD and judging by the calm, protective way he had acted around all our other animals, I felt he woul be fine. But I had no idea how Shadow, our black lab, would react. 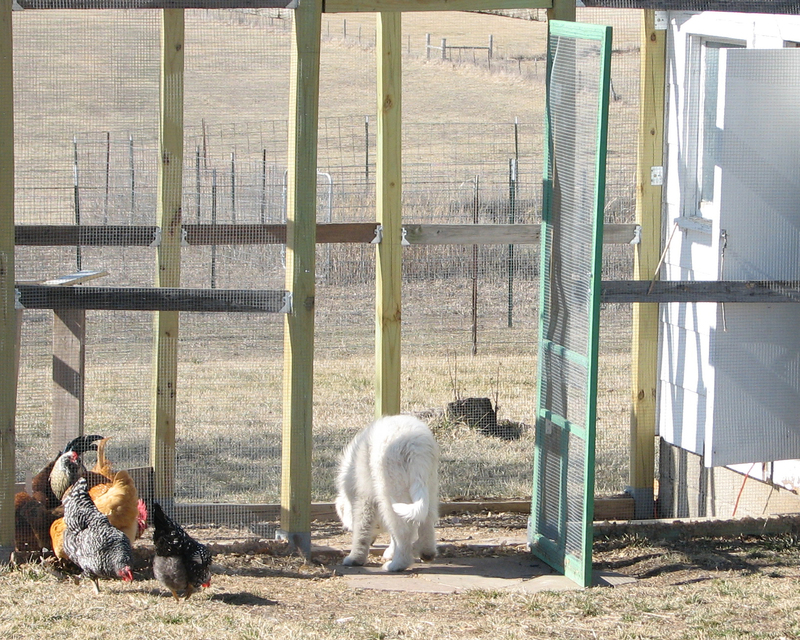 But the time came when we were ready to let the chickens explore more of their world. 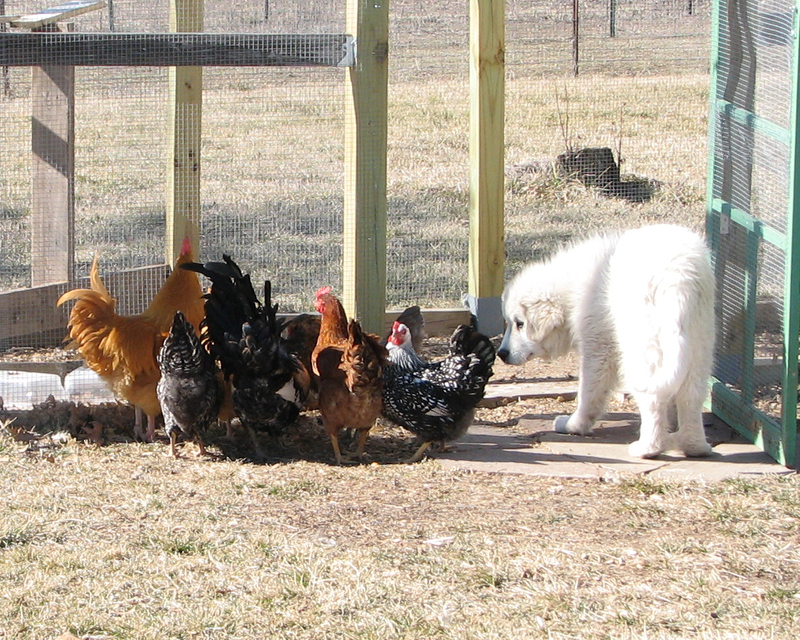 And it didn’t take long at all for them to venture out…..
Balto took a good, up close (and rather personal) look to make sure all was well…..
Then while the chickens were exploring the new world outside, Balto was curious about their world inside….. 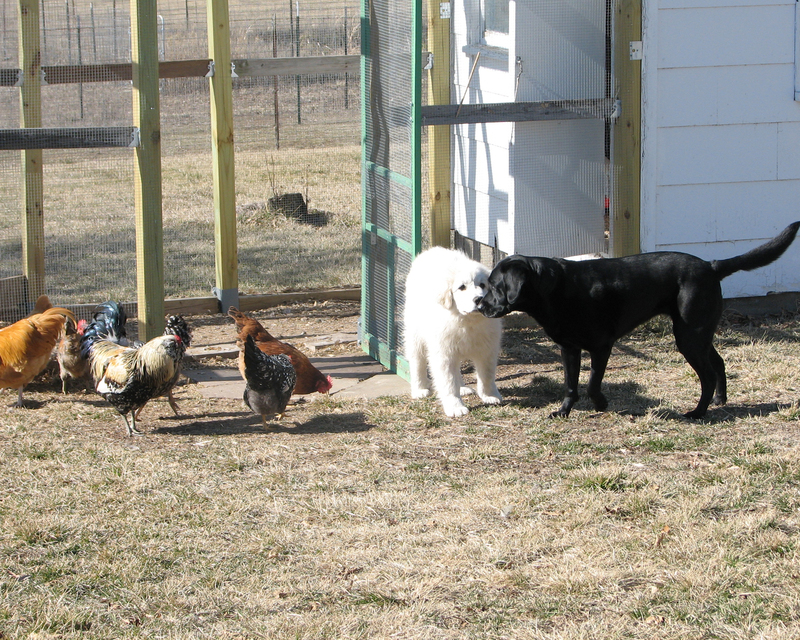 Shadow was perfect around the chickens…..didn’t scare them or bother them in any way. Everyone got along beautifully. The chickens wandered a little further than I though they would, but when I went out around 5:00 to get them inside and safe for the night, they were already settled down back in their coop. The chickens first day out went really well. 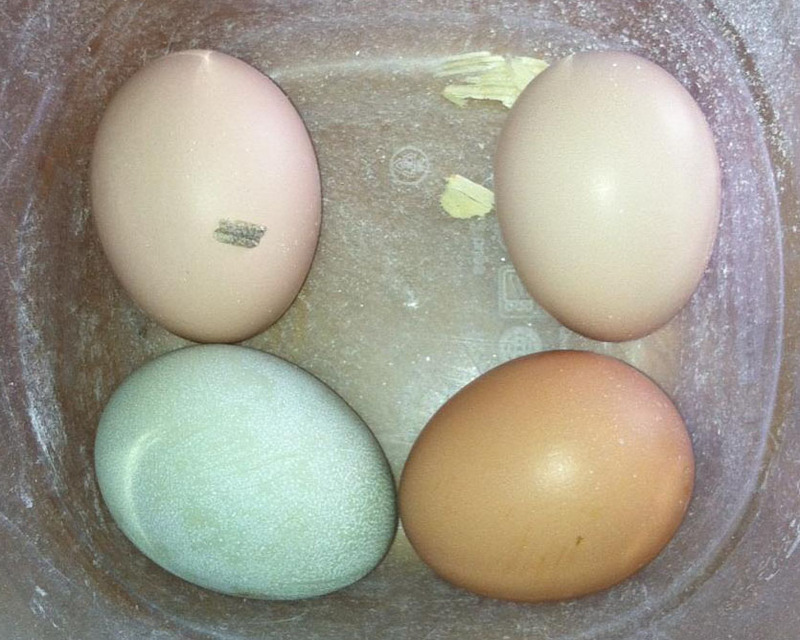 It has been really exciting around the farm this week because our hens are laying their first eggs. From our 5 hens, we got 14 eggs last week! Unfortunately 6 of the eggs we ended up throwing out as we weren’t sure how long they had been sitting around before we found them. But now that we are in an egg gathering routine (and have hopefully found all their hiding places) we will not waste any of our eggs. So this morning I had 8 of my hen’s eggs that I was ready to scramble. But, all of the sudden it occured to me that I had never had an egg like this before. 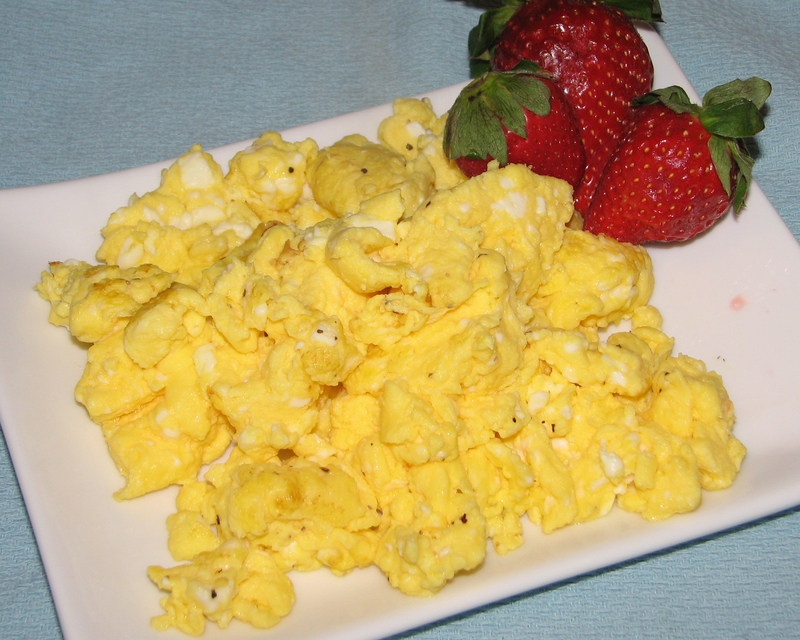 In all of my 50+ years, as far as I know, I have always had eggs bought at the grocery store. Now I know this isn’t a good thing. 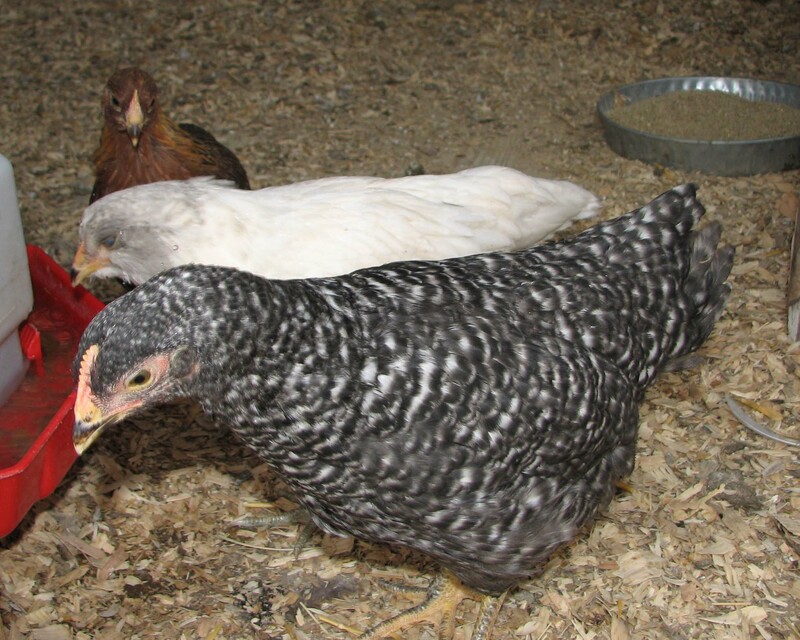 I have heard all about how bad store bought eggs can be and the deplorable conditions that laying hens are subject to, just so I can go to the grocery store and purchase eggs. That is one of the reasons I moved to the farm, purchased my chicks and have read book after book on how to raise them so that I will know what I am eating. But when it came time to actually use my first farm raised hen’s egg, I will admit it felt a little strange. I don’t know what I was afraid I would see when I cracked open that first egg, but this is what I got……..
Beautiful looking eggs! 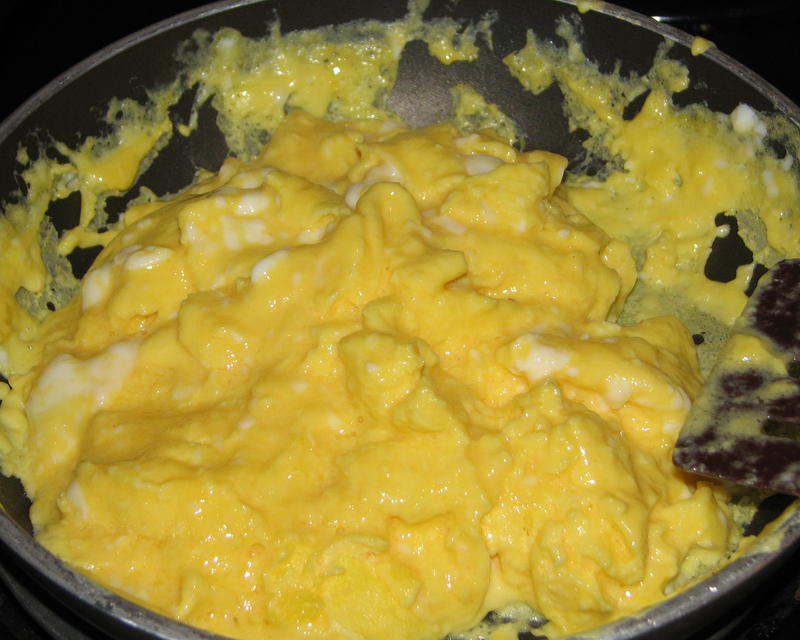 So I whipped them up, added some milk like my family likes and prepared them for the stove. and put them on a plate. They were delicious and I can now say with confidence, I am no longer afraid of the egg! I am proud that we are raising our hens humanely (they are actually quite spoiled I think). They have room to grow, a safe place to nest, and have healthy food and plenty of fresh water at all times. 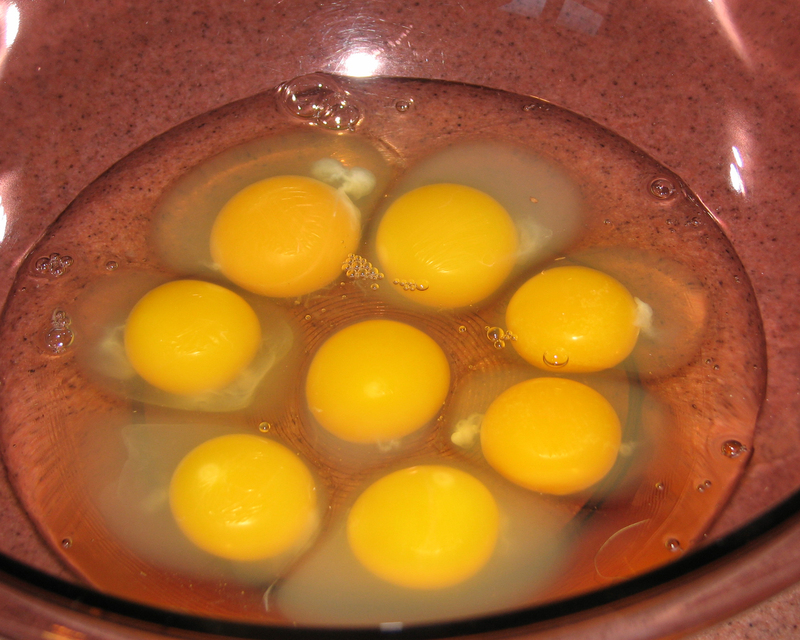 And now, they are producing delicious and healthy eggs!